Although the winter season has come and gone, there are still athletes who work towards their goals no matter what the temperature is like outside. Berlin’s Connor Recck and Southington’s Megan Biscoglio have proven to be those kind of athletes and hardly take any time off during the year as they hone their crafts. Recck, who swims 11 months out of the year, just wrapped up his junior year with the Redcoats where he played a major part in the boys swim team’s success. "Connor won every individual event that he swam in dual meet competition this year,” Berlin head coach Daniel Thurston said. Throughout the season, the junior swam the 200 freestyle, 200 IM, 100 butterfly, 100 freestyle, 100 breaststroke and more. Recck closed out the CCC schedule all-conference in four events by winning the 200 IM and 100 breaststroke, as well as being a part of Berlin’s first place 200 medley relay and second place 400 free relay. He then went on to show just as well in the Class M meet where he finished fourth in the 100 freestyle with a personal best of time of 48.99. He also placed fourth in the 100 breaststroke while breaking the school record with a time of 1:00.91. Recck was also the lead of the 200 freestyle relay at Class Ms with personal best of 22.76, as it finished 19th with a time of 1:31.77 and set a new school record. That allowed him to qualify for the State Open in the 100 freestyle, where he finished 15th with a time of 48.67 and the 100 breaststroke, where he finished 21st after clocking in 1:01.45. This year, Southington’s Biscoglio is used to breaking records and this season was not different. The senior did just that on her way to claiming the Class LL indoor pole vaulting state title as well as tied for the best leap at the State Open, though she officially finished third at that meet. She cleared 12 feet, 2½ inches, which set a new indoor pole vaulting record at Southington High School. Biscoglio started pole vaulting as a freshman after an injury that ended her gymnastics career. At first, it was a lot of trial and error and watched YouTube videos and tutorials to figure things out. Biscoglio owes all of her pole vaulting success to the nine coaches and instructors at Patriot Pole Vault in Massachusetts that work with her in addition to the track coaches for the Blue Knights. And while the the indoor season may be over the outdoor season has just begun. 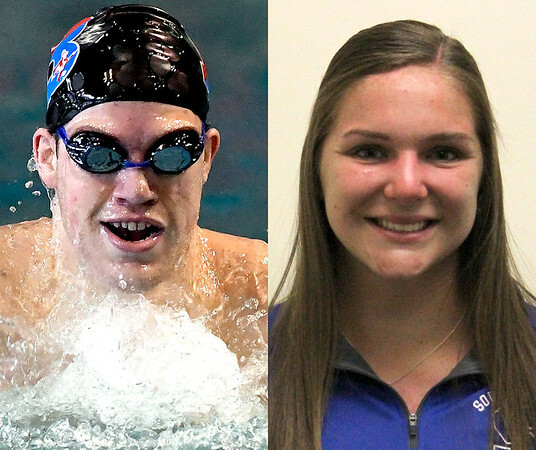 Posted in New Britain Herald, Athletes of the Week, Berlin, Southington on Monday, 2 April 2018 20:40. Updated: Monday, 2 April 2018 20:43.